This interivew accompanies the Reissues launch of the complete run of Zuk, 1987-89 (edited by Claude Royet-Journoud). 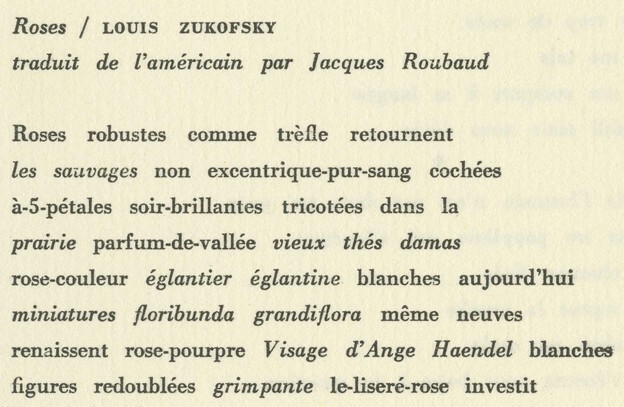 Below is a substantial extract of “La poésie au format Zuk,” an interview of Royet-Journoud by Jacqueline Pluet on the subject of Zuk, published in issue 5 of La revue des revues in the spring of 1988. The interview can be found in full in Eric Pesty's Claude Royet-Journoud. Une Bibliographie Tome 1, 1962-2003. For more information on that publication, see here. The Jacket2 edition of this interview is excerpted and translated by Abigail Lang. J.P: Where does the enigmatic title Zuk come from? CRJ: Zuk is short for one of the greatest American poets, Louis Zukofsky, who died in 1978. Concerning Anglo-American literature, one generally attributes a certain modernity to Pound and Joyce, minimizing the importance of Gertrude Stein and Zukofsky. We asserted the theoretical and political — at the poetical level, of course — importance of Zukofsky almost twenty years ago by publishing the first fragment of Zukofsky’s long poem “A” in French in Siècle à Mains[i], edited by Anne-Marie Albiach, Michel Couturier (who died in 1987) and myself, in a translation by Anne-Marie Albiach (n°12, spring 1970). Later I edited several magazines whose titles invoked Zukofsky. In 1987, it was the small magazine “A”[ii] which I co-edited with Alain Veinstein and which ceased publication upon the death of Zukofsky, after 21 issues. Later, Emmanuel Hocquard and I collected an anthology of monostichs — one-line poems — under the aegis of Zukofsky since it was entitled LZ. JP: Why a 4-page magazine? CRJ: I must indicate that it’s the first time that a magazine of mine is published by a publisher, Emmanuel Ponsart, and I’m extremely grateful to him. Spectres familiers was already publishing another magazine, Skoria, and I think couldn’t afford to burden their production, and that a lightweight publication suited them better. I felt like something small but regular, on a monthly basis. And I don’t see why a magazine should be 150 pages to deserve being called a magazine. Zuk is entirely printed in size eight font, the size of footnotes in books. This goes unnoticed because the space between the lines is much wider than usual. The characters are small but legible and we have a lot of text. I got the idea from seeing the catalogue of Spectre familiers editions whose layout I liked immensely. Of course, this creates some constraints as to the choice of texts but my experience has now taught me that it’s feasible. I design the magazine like a huge painting; I start at the bottom left, continue on the top right, moving toward the middle. I have a sense of the whole beforehand as I work simultaneously on all the issues of a given year. It’s the layout, the organization of space — also in time — that I like in a magazine, which is a bit like a book with several authors. Of course, in Zuk I cannot give the poem the space it deserves and needs to breathe, the way Siècle à mains did. I have to cut the poem, to run on to the next page. Still, the smallness of the page doesn’t preclude the ambition of the project. Each issue features at least five authors and stretches across a vast geographical area if little paper. The authors are from Guadeloupe, the United States, Italy, or France, but maybe they all belong to the same literary territory. JP: Zuk is clearly the work of just one man. How do you select texts? CRJ: I edit Zuk on my own and I only publish unpublished material which I commission. I don’t want to receive unsolicited texts. I have a very specific project in mind. I don’t mean that all the texts are specifically written for Zuk — the expression is ambigous — maybe only the translations… but it’s true that some of them are written for the magazine. Some authors recur on a regular basis, in installments, in ongoing poems that continue under the same title. TMCL by Dominique Fourcade, for example, or Grammaire by Jean Daive, or Marcel Cohen’s short stories. I want to hold readers breathless, I want them to know they will discover a young generation of Americans, poets they won’t just be reading random snippets from; that they will be getting a specific work which develops as the months go by. JP: American poetry seems particularly privileged in Zuk. CRJ: Zuk is not primarily devoted to American poetry but it so happens that I’m familiar with it and well placed to make it known, with the help of translators who I entirely trust, Françoise de Laroque, Dominique Fourcade, and Joseph Guglielmi for instance. But the magazine’s true vocation is to publish Jabès as well as Maria Obino, Bernard Collin, or Mathieu Bénézet. I spend a long time selecting texts for obvious reasons imposed by the magazine’s format and sometimes the length of a text influences the decision over and above my pleasure in reading it. The fact is I have to count lines and signs with extreme precision: I can’t have more than 60 characters per line and 24 lines per page. There are texts I can’t publish because they have one line too many (and with three lines missing, it would be a shame to waste space). This is why my name doesn’t appear as chief editor; that’s one precious line saved. JP: Could you tell us the run of the magazine, the number of subscribers, and who Zuk’s readers are, if you can at all get a sense of the readership through subscription. JP: I notice that your name appears neither in Zuk nor in In-Plano[iii] and that it’s only in the next to last issue of Siècle à Mains that you published one of your poems. How do you conceive of the relationship between your own work as a writer and your work as an editor? CRJ: For me, it’s a natural gesture to write and make known, to publish — the latter term is more accurate, it’s about leaving an active trace — texts that you like. I even consider it as a theoretical gesture, it enables me to make a theoretical statement without theorizing. Indeed, this coherence I’m after in Zuk — however small the magazine — is not the result of chance, it is the product of long reflections about what it means to write, what it means to read: why we need such texts at a particular time, and not at any other time. The poetry magazines I publish are aimed at people who write or want to write. They are movements, steps in a direction even if one cannot be sure what will come of them. I feel a poetry magazine ought to hold a sort of incandescence, to live on the edge of implosion, which is the very opposite of the magazine-as-collection, which is useful of course, but too tame. I conceive the poetry magazine as a passion. [i] SIÈCLE À MAINS – Magazine and collection published on an irregular basis, founded by Claude Royet-Journoud, co-edited from 1967 with Anne-Marie Albiach, and from 1970, with Michel Couturier ; n°1 - 12, September 1963 - Spring 1970, London and Neuilly-sur-Seine. Number of pages and format vary. [ii] « A » – Xeroxed magazine edited by Claude Royet-Journoud and Alain Veinstein; n° 1 - 21, 1976 -1978, Paris, 4 pages (covers reproduce Greek schoolchildren’s notebooks), 150 x 205 mm. [iii] L'IN-PLANO – Xeroxed daily, edited by Claude Royet-Journoud, published Monday through Friday; n° 1 - 80, 15 January - 6 May 1986, 295 x 210 mm, 2 pages. One author per issue and per day. Notes, selections, interviews, and expanded content supplementing the Reissues archival platform on Jacket2. In addition to editorial explorations of the Reissues project, this commentary considers broader currents in the practice of transcoding—generally understood as the processes of translation operating between analog artifacts and networked objects. Turning to online archives like Eclipse and The Modernist Journals Project, it reflects on the means and modes of understanding periodical culture from a database perspective. At the same time, these transcoded periodicals are investigated for what they might tell us about contemporary poetics and networked practices.